Here's a fun and very easy magic trick with playing cards. Here, you apparently cause an ace to change suits. How can this be accomplished? Read on. In this easy magic trick, an ace of diamonds mysteriously turns into an ace of hearts. There are no gimmicks and this one is super easy to learn and perform. Another fun aspect, in the end, you're clean. The spectator can examine the cards and there's nothing to find. The cards are perfectly normal. It's all in the way that you hold the cards, which creates a visual illusion. 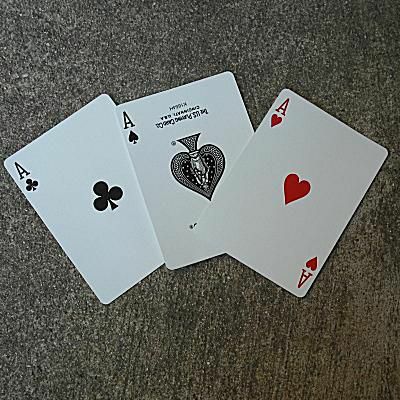 Three cards: ace of clubs, ace of spades and ace of hearts. Simply remove these cards from any deck and you're ready to go. There's a bit of preparation before you perform the trick. Refer to the picture to arrange and hold the cards in the exact same manner. Notice that the ace of hearts is held in the back - between the other two fanned cards - and the large heart in its center is upside down. When held with the other two cards, the point of the heart resembles a diamond. This is the secret to the trick. You can arrange the cards ahead of time and then show them to the spectator. However, this may look rather stilted. If you're tightly holding the cards, spectators may wonder why you're handling the cards in such a stiff and controlled manner. It's probably better to bring out the cards without showing them to spectators and fan them towards yourself and arrange them as you look at them. Take special care that the tip of the heart resembles a "diamond." 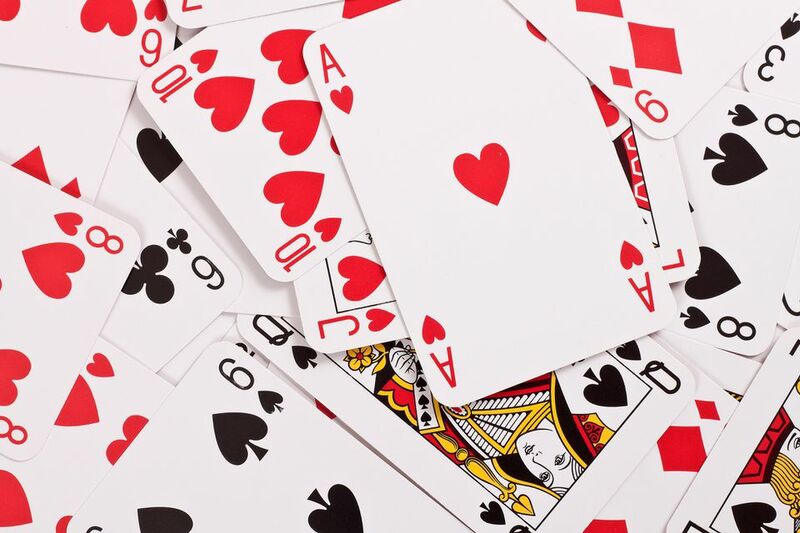 When you're happy with the arrangement of the cards and that the heart looks reasonably like a "diamond," you can turn the cards around and show them to your spectators. Briefly show the three cards and ask the spectators to memorize them. Note that you're not bringing special attention to the center card. If you say something specific about the "diamond," spectators may suspect something is different about it. Just allow spectators a brief glance and challenge them to memorize the cards and their order. Turn the cards over so that they're face down. One at a time, turn over the ace of clubs and ace of spades and display them and lay them onto the table or place them into your pocket. Leave the last card (ace of hearts) face down. Ask the spectators if they can name the last card. When they say "ace of diamonds," have them turn over the final card to reveal that it is an ace of hearts and not an ace of diamonds. At this point, you can allow spectators to examine the cards and there's nothing to find.